How did Cecily McMillan go from being one of Occupy Wall Street’s staunchest advocates of nonviolence to a prisoner accused of assaulting a police officer? In The Emancipation of Cecily McMillan, she tells her own story: her childhood, her political development, her trial and her incarceration. Click here to order this book from Truthout! In this condensed excerpt from The Emancipation of Cecily McMillan, she describes the arbitrary injustice of Rikers Island as she first experienced it after her conviction. The East River is a salt-water tidal strait that flows northward along the eastern shore of Manhattan Island, then bends due east between the Bronx and Queens before returning to the Atlantic. Just past that eastward bend, with Queens to the south and the Bronx to the north, lies Rikers Island, a hard to get to (and harder to get out of ) outpost of cruelty and misery, just across the water from LaGuardia Airport. The island is flat and treeless and surrounded by razorsharp barbed wire fences; its only link to the mainland, the Elmhurst neighborhood of Queens, is a narrow causeway. Rikers is called a “jail complex” rather than a “prison” because the inmates are confined there, supposedly, for a short time only. The majority of them are “innocent” (until proven guilty, theoretically), with a small population of “guilty” inmates (in other words, poor people of color who didn’t have the time or money to take their case to trial) sentenced to one year in jail or less. In reality, though, those inmates awaiting trial — or, generally, the lowest possible plea bargain — are often held much longer than convicts. One man reportedly waited seven years on Rikers before being offered a plea deal by the Manhattan DA’s office. More notoriously, Kalief Browder was arrested at age sixteen for allegedly stealing a backpack; after serving three years, two of them in solitary confinement, his charges were dismissed and he was released — his name cleared at the cost of his childhood and, ultimately, his life. Kalief, unable to overcome the trauma of Rikers, committed suicide two years later. As newsworthy as these stories may be, they seem to be more routine than anomaly: while in Rikers, I met more than a handful of women who had been in for as long as Kalief was and one, specifically, who had been imprisoned for five years (without, once again, being convicted of anything). In fact, now that I think about it, I saw no evidence whatsoever of this alleged “right to a speedy trial,” and I never once met anyone who thought they’d get a fair one. When Rikers Island was originally settled by the Dutch in the seventeenth century, it was only ninety acres. Then, in the early twentieth century, it was expanded to more than four hundred acres so it could serve as a landfill for New York City. During that period, it was also the allotted dumping grounds for its routine street sweepings. In the twenty-first century, the city still deposits its trash on the island — but now it comes in the form of human beings who, by the standards of our criminal justice system, are either undeserving of justice or are so poorly represented that their injustices will undoubtedly go uncontested. The island houses ten separate jails, all run by the Department of Corrections. If New York police officers are allegedly New York’s Finest, the corrections officers who operated Rikers are “New York’s Boldest” — at least according to the “welcome” sign posted at the Queens end of the bridge to Rikers. Their notoriously aggressive treatment of inmates at Rikers must have earned them that nickname. My expectations of prison were better grounded than most, I suspect — largely shaped by my brother’s experience and my efforts from the outside to win him decent treatment. But, even so, I wasn’t prepared for the life (and, sometimes death) of Rikers. Movies and television make prison out to be tough and grim, to be sure, but also ordered and disciplined — a place of routine violence that you can anticipate, expect. Follow the rules, keep your nose clean, don’t piss off the wrong people (or, otherwise, pay off the right people), and you’ll survive. But that’s not how things work at all, at least not at Rikers. Rikers is chaos. A maddening, totally unhinged state of chaos — you can’t predict what will happen, you can’t prepare for it. There is no reason, no “why?” or “because….” It just is. That’s how things work there, with or without your consent. You are at the whim of whichever guard is nearest at the minute, and the guards are at the whim of whichever captain is making rounds that hour, and the captains are at the whim of, well, that’s where things get a little murky: either Commissioner of New York City Jails Joseph Ponte or Norman Seabrook, president of the Correctional Officer’s Benevolent Association (the laughably named union), both of whom seem to be gridlocked in a struggle for power over what seems to be the uncontrollable, unforgiving force of Rikers Island itself. It’s kind of like that TV show “Lost,” except everyone knows exactly where the prisoners are and what’s happening to them — yet, there they remain, left to suffer and die. That, right there, is the real violence of Rikers: chaos on the inside and complacency on the outside. The making of an unlikely political prisoner, in her own words. Click here now to get the book! When I went in, my “Activist Barbie” trial persona (still entombed in a plastic Nordstrom bag) was taken from me and disposed of “in the back,” where she was then exhumed and dismembered, according to the property receipt I received in exchange; that, in addition to my notebook (the one I was using earlier to draft my “innocent speech”) were the only remaining records that she’d ever existed — that I’d ever been a person worth defending. Now, I was just a prisoner. I’d soon learn that I wasn’t entitled to anything in there, not even a name. That I was no longer seen as a woman anymore, not even a person — from now on, I was only a number. Inmate Number 310-14-00431. An identity I might have to get used to for possibly the next seven years. In the jungle, the mighty jungle, The lion sleeps tonight. And by the time she got to the chorus (“Wimoweh, wimoweh, wimoweh, wimoweh…”), other women had joined in, and soon the whole room was singing, the first woman taking the lead and now belting the words unabashedly. I didn’t sing. I still hid beneath the covers, still had snot all over me. But I stopped crying. Okay, I thought, slowing my breath. I’m OK — I can survive this. But I wouldn’t survive it — not like I had everything else anyway: push forward, get through it, move on, and dump it. With help from the women of Rose M. Singer, I’d struggle with it, accept it, and live through it. I would come to find community in Rosie’s, even family; a family that would not only sustain me, but also set me free. Cecily McMillan is a social justice organizer and advocate for prison reform. After enduring a Kafka-esque trial following her arrest at Occupy Wall Street in 2012, she served three months at Rikers Island. Her writing has appeared in the New York Times, Al Jazeera America and The Huffington Post. She currently lives and works as an organizer in Atlanta. 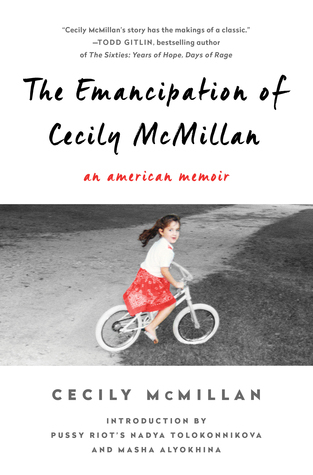 Her memoir, The Emancipation of Cecily McMillan, was recently published by Nation Books. The judge may have intended to send a message to those who dissent, instead may have created a powerful messenger of dissent. Cecily discusses her activism, her experiences with the criminal justice system and the myriad ways that gender shaped both her own experiences and those of incarcerated women.